It was an amazing experience to drive upto Agra from Delhi by using Yamuna Expressway inaugurated on 09th August 2012 by U.P Chief Minister Akhilesh Yadav. I went to Agra on 13th August along with my friends to see much hyped Yamuna Expressway. But after experiencing such a marvelous drive I could say this is probably be one of the best expressway in India. I could have never imagined that I would get the city of Taj Mahal in merely 2 hours and 30 minutes by road. It was awesome drive. Because I had experienced the drive on old highway before from Delhi and Agra and took 4 to 5 hrs (one side) in every single trip.The idea of building such a wonderful expressway is to minimizes travel time between two historically significant city ; Delhi and Agra. There are four toll booths on the way to Agra and one has to pay probably over Rs.500 for both ways. It was free before 15th August so I did not have to pay any sort of toll charges as I went before 15th August. 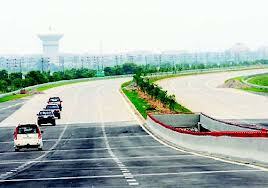 Yamuna Expressway is a six lanes road with the maximum speed allowed for cars is 100 km/hrs. Restaurants and public convenience(toilets) are available on the either side of Expressway. I have also seen some of the safety cars patrolling on the Expressway in search of any mishap on the road, would be a great feature added up to the Yamuna Expressway for the people. Distance has been reduced to 165 kms as compared to the old stretch for 210 kms. I went to Agra form the southern part of Delhi which is closer to the gateway of Yamuna express way. In my opinion it might take more time to reach to Agra from another parts of Delhi probably 3 to 4 hours but Yamuna Expressway is indeed a hassle free drive for sure. I have not seen any petrol/diesel/CNG stations on Expressway as of now, so before leaving home make sure you car tank has enough petrol/diesel/CNG to drive you out for both sides. 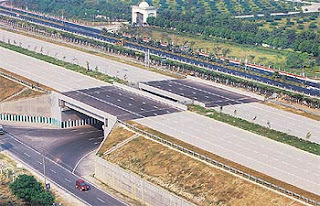 Since Yamuna Expressway has been introduced, Agra has become an excursion site from Delhi. Before it, people used to travel by train to reach Agra and come back in a day. Shatabdi train is still a favorite to get Agra from Delhi and come back but looking at the increasing number of tourist by the day for this particular sector Agra, one must have an option to go to Agra as quick as train does. Now people have option to get Agra by road as well by using Expressway in more or less same time train takes. I am sure! more features to be added on to the Yamuna expressway as time progresses to make it more equipped and safe. I have received positive feedback from the people who those have experienced drive on Yamuna expressway so far. Agra has now become a favorite excursion tourist site for the people who lives in or visits Delhi.Coming to the same day Agra tour by train, I would only say that though we have trains available which is much cheaper than traveling by road, but going to Agra by Yamuna expressway is also a worth visiting.